Whatever horror movies might depict; zombies staggering around, wall-eyed living dead, skeletons grinning evilly – we know that this is the stuff of make-believe. Life requires heartbeat, brain function, muscles and a multitude of complex interdependent systems to continue. Once a human being has been dead for any length of time, the recollection of what they once were – warm, living flesh and blood, able to move of their own accord, speak, listen and function as a living being – becomes increasingly difficult to visualise let alone become a reality. So the question put to the Prophet Ezekiel, author of one of the longest prophecies of the Old Testament, is a strange one. Had the question been posed by anyone else, Ezekiel would undoubtedly have replied; ‘Don’t be ridiculous!’ or words to that effect. 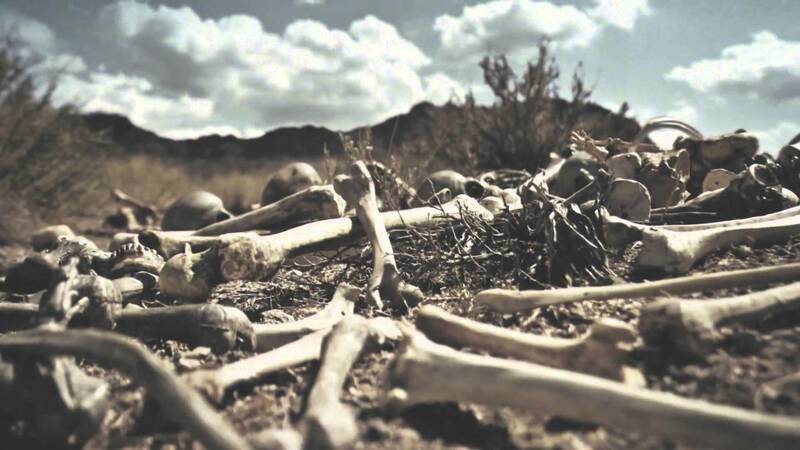 The bones were not only very dry; they were dispersed all around the valley floor. Thousands of bones – it would take a team of forensic scientists years to assemble each skeleton together again and the end result would be no more alive. The rest of the vision is astonishing, terrifying even. Upon being commanded to speak to the bones, there is a great rattling and an unseen force drags the desiccated remains together, bone to bone until each is matched to its skeleton. Then the same force restores muscles, tissues, eyes, blood vessels, organs and skin to each so that now Ezekiel is looking upon a great army of dead men. A two stage process. The assembly of a chaotic disarray of bones into ordered but dead bodies is followed by the breath (or Spirit) of God energising and resurrecting them into a mighty army that stands upright. As prophecies go, this one is strikingly clear. Its interpretation is found in the next few verses. The vision relates to the nation of Israel. It predicts that they will find themselves in a helpless and hopeless condition, scattered over a wide area with no prospect of being restored to nationhood. Could there be a clearer sign for our day and age? In the course of eighty years the Jewish people have gone from being the ragged, emaciated survivors of the concentration camps to amongst the most advanced culture and nation on earth. Industry, expertise, ingenuity – these are the hallmarks of the collective nation called the State of Israel – a concept that for nineteen centuries was little more than a forlorn prayer on the lips of the faithful. ‘I will put My Spirit in you, and you shall live, and I will place you in your own land’? The nation of Israel are a wonderful witness to the Living God. Back from the long dead. But although as a nation they thrive, in God’s sight they are just lifeless bodies, waiting for the One who can bring life. The Lord Jesus Christ will return to save the nation in their darkest hour and in Him they will find abundant life. So it remains for Israel to truly live. Presently they exist, clinging on to their precious tract of land surrounded by fierce and implacable hatred. But God has decreed that one day they will recognise Jesus as their Messiah and live in peace and harmony with their Creator in the land that God promised to their first ancestor, Abraham. Dead bones don’t come to life again. It is a ridiculous idea. But we are talking about the God who created the Universe. He can, and does what He likes. He can give you true life as well. 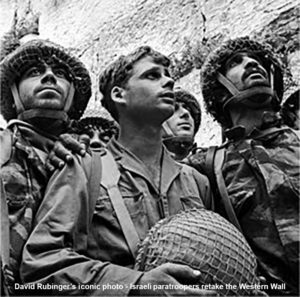 This anniversary takes us back to what has become known as the Six Day War because it lasted for six days from June 5th – 10th 1967. On paper, it is a war that Israel should not have won. In May 1967 Egypt had instructed the United Nations Emergency Force (UNEF) to leave the Sinai Desert and then mobilized its forces along the Israeli border. Syria and Jordan, too, moved into a state of alert and announced that they would not sit by idly if Israel attacked Egypt. Israel were outnumbered, outgunned and surrounded. It is even more remarkable because of the speed and scale of the victory. 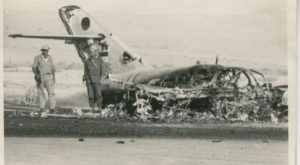 By the end of the first day, half the Egyptian Air Force had been destroyed, without even taking off, and most of the Royal Jordanian Air Force and Syrian Air Force has also been wiped out. In only six days Israel tripled the area under its control, seizing Gaza and the Sinai Peninsula from Egypt in the south, the Golan Heights from Syria in the north, West Bank and East Jerusalem from Jordan. 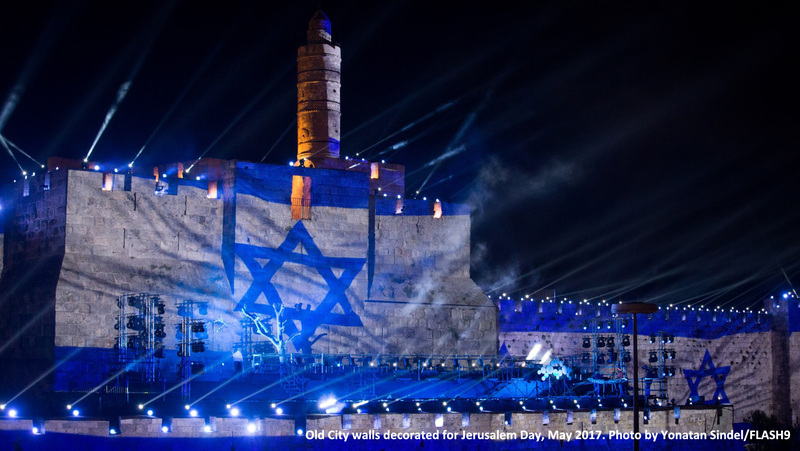 For the Bible student, it is momentous because Jerusalem, divided since 1948, was re-unified under the control of Israel for the first time since the destruction of the Temple and Jerusalem in AD 70. We are watching for the time when Jesus will return to this earth to set up God’s Kingdom and the Bible gives us signs of when that is going to happen. 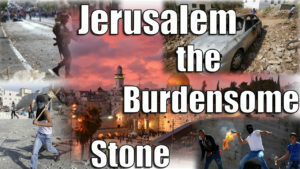 A big sign is that Israel will be back in the land and that Jerusalem will be a “burdensome stone”. This is the great irony – the result of the reunification of Jerusalem, is that it has never been more divided! The rift and conflict between Israel and Arab nations was intensified and 50 years on, that has only got worse. You only need to read and watch the news each day to see how burdensome Jerusalem has become with the affects rippling through world affairs. A critical part of the victory was gaining aerial superiority. Jordanian radar picked up the Israeli attack but the Egyptians, having changed radio frequencies the day before, were unable to receive the warning! Directives from Egyptian leaders were incoherent and disorganized, and at times, non-existent. Israeli ground troops advanced in Sinai to find that, for no apparent reason, Egyptian forces had abandoned bases and destroyed or left their equipment. Similarly, later in the Golan heights against Syria. 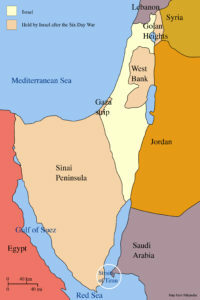 Political pressure was mounting from leading nations for Israel to accept a ceasefire proposed by King Hussein of Jordan. However, at the last minute, the ceasefire fell through due to the unwillingness of King Hussein to comply with the terms of the ceasefire he initiated! “The king’s heart is in the hand of the LORD, as the rivers of water: he turneth it whithersoever he will.” Proverbs 21v1. Verses like this remind us that ultimately it is God that is in control, not men and women. 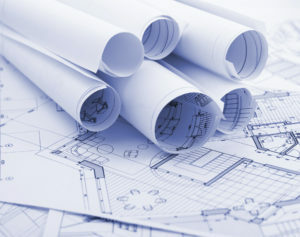 We can see God’s hand at work as he continues to progress his plan and purpose with this earth, culminating in the return of Jesus to set up his Kingdom. We know from the Bible, that there will be more trouble to come for Jerusalem but eventually it will be God’s City of Peace at the centre of his Kingdom. Have you ever wondered why Israel is in the News so often? Why there is always conflict in the middle east? Well, if you haven’t you should because the answer affects us all. In the Bible we read that Israel are an important people in God’s plan so watching what is happening in that part of the world is also important to us. 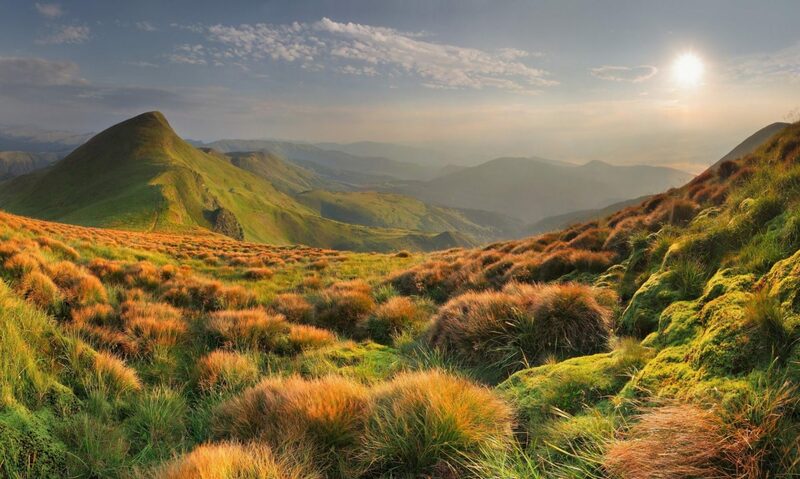 In Isaiah 43, God said to Israel “You are my witnesses…”, meaning that Israel are a witness to the existence of God. When we see things that the Bible has said about this nation coming true, we can have confidence and belief in God. For example, this year marks the anniversaries of 2 extraordinary events, that relate to the establishment of the State of Israel. 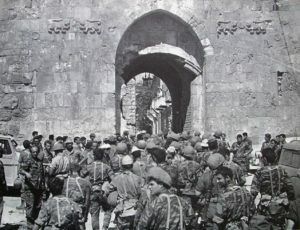 • 7th June is the 50 year anniversary of the reunification of Jerusalem (1967), during the ‘Six-Day War’. 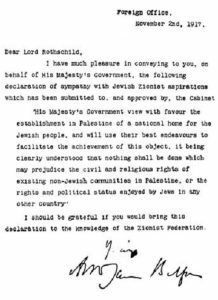 The Balfour Declaration was a single paragraph in a letter from the UK Foreign Secretary Arthur James Balfour to Walter Rothschild, a leader of the British Jewish community. In the letter, support was given for the establishment in Palestine of a national home for the Jewish people, whilst committing to maintain the rights of existing non-Jewish communities in Palestine. For hundreds of years Israel were scattered across the world. The Balfour Declaration was a significant turning point and against all likelihood we had the start of them returning to the land of Israel. No other nation in history has been through similar experiences over such a timespan and survived – and yet here Israel are. When you look at the events that led to the reunification of Jerusalem in 1967, during the 6 day war, they are mind blowing. All human logic and reasoning says that Israel should have been utterly defeated and yet not just did they survive, they came out of it with even more territory than before. A truly miraculous outcome? There is no doubt that during this period and continuing to today, there are some terrible things being done by all sides involved. Sadly, such acts only bear witness to the hopelessness of human nature. Despite this troubling human side, the remarkable part is that what we see happening is exactly what God said would happen. God willing, we plan to hold 2 public talks as part of these anniversaries. 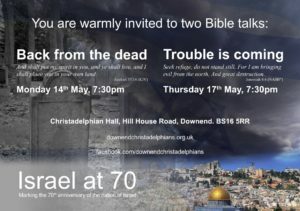 We do not take any political views or sides in any of these events so cannot offer anything on that but we would love to see you there to instead share how these events are a miraculous witness to the truth of the Bible and of God. 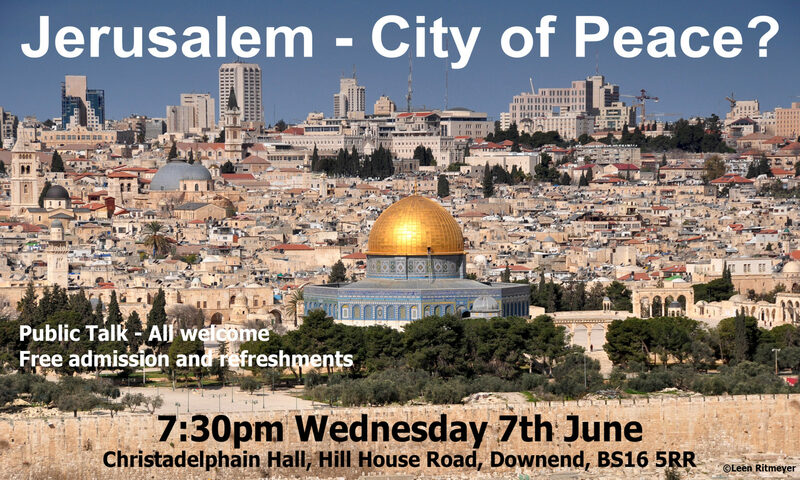 Our first presentation is titled “Jerusalem – City of Peace?”, to be held at 19:30 on Wednesday 7th June 2017 at Christadelphian Hall, Hill House Road, Downend. BS16 5RR.